It's cookie-baking-palooza at our house. Cookies for school parties. Cookies for office get-togethers. Cookies for family holiday gatherings. Cookies. Cookies. Cookies. 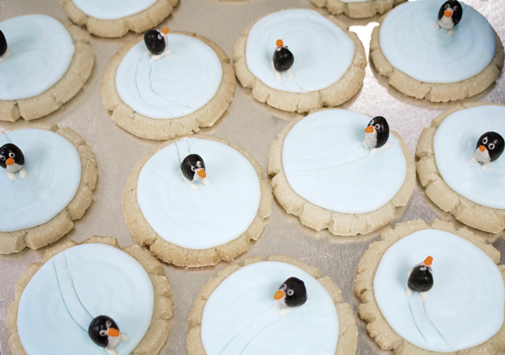 I made these ice skating penguin cookies for an office party at WSU this week. 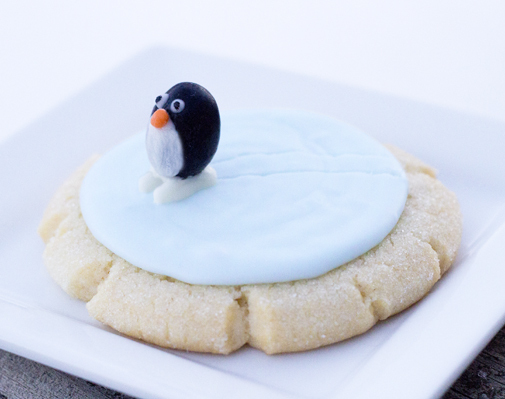 I used my favorite, simple, Kansas Sugar Cookie recipe, frosted with a light blue, lemon-y royal icing. The penguins are made from black licorice jelly beans. I added white chocolate eyes, bellies and skates, and used orange Nerd candies for the itty bitty beaks. If you look closely, you can see the little skate marks on the frosting "ice." They made a fun & festive addition to our potluck party table. * FYI... I made more of these for our family Christmas gatherings and couldn't find any more black jelly beans for the penguins, so I used Junior Mints instead. They were just as cute, and even more refreshing! George Strait said it best.